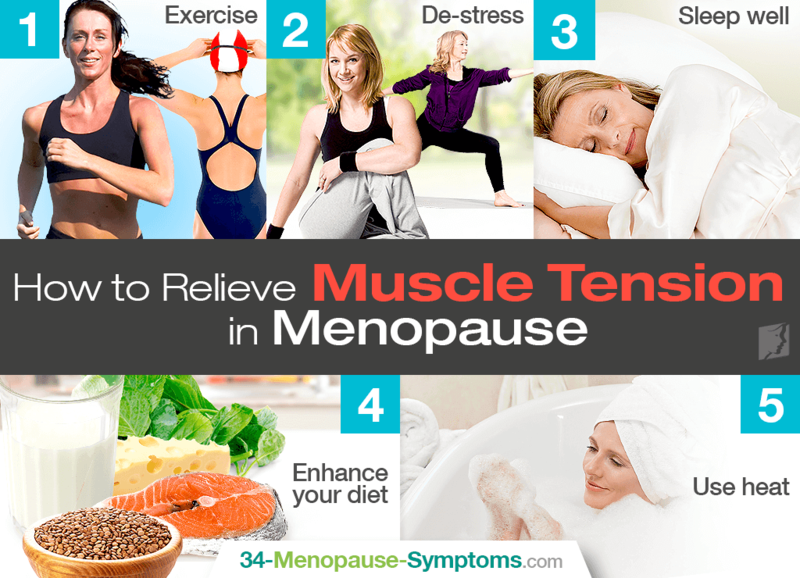 Muscle tension is a common symptom of menopause. Although it can affect any muscle in the body, the muscles in the back, shoulders, and neck are often the ones that are affected the most. Fortunately, there are ways to relieve the tension and reduce pain levels. Read on to find out more about how to relieve muscle tension during menopause below. Choose an exercise that doesn't put too much extra strain on your muscles. Swimming, brisk walking, or jogging is useful in reducing muscle tension. Do not over-do it as this could have the reverse effect on your muscles. Try to get at least 30 minutes of gentle exercise each day, and be sure to stretch before and after to release muscle tightness. De-stressing allows the muscles to loosen. It can include daily relaxation practices of tai chi, deep breathing exercises, progressive muscle relaxation techniques, massages, physiotherapy, or yoga, which encourages fresh blood flow to all the glands and muscles, allowing them to depressurize. These treatments will relieve the tension in muscles and leave you feeling loosened and flexible. If you want to reduce muscle tension during menopause, then it is essential you get the recommended amount of sleep each night so that your body has time to recover from the long day recently put at rest. Adults are to get between seven to nine hours of sleep each night; however, this will vary from person to person. Eating a well-balanced diet filled with foods that are high in calcium, magnesium, or Vitamin E will help alleviate muscle tension during menopause. Eating more foods that contain omega-3 fatty acids, like fatty fish, will also help. Try to avoid foods that are particularly high in carbohydrates and sugars because they produce insulin, which causes inflammation and strain on your muscles. Heat always soothes tense muscles. Take a long, warm bath before going to sleep so you don't have trouble sleeping due to muscle tenseness. A sauna or another form of heat therapy will also have the same effect on your muscles. Reconsider this if you are simultaneously suffering hot flashes. To find out more information about natural and effective ways to relieve muscle tension during menopause, click on the following link for muscle tension treatments.